Offered annually in spring quarter. Preparation: FISH 290 or equivalent experience in scientific writing, and FISH 311 or equivalent background in fish biology. There are 5-credit (lecture plus field trips and labs) and 3-credit (lecture only) sections. Most fisheries problems occur and are addressed in definable habitats, though migratory species depend on several habitats. 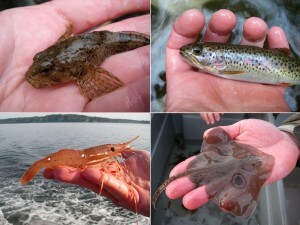 The goal of FISH 312 is to examine a variety of North American aquatic habitats and explain the physical factors (such as temperature, substrate, salinity, etc. ), biotic factors (chiefly predation and competition) and human-related factors (dams, pollution, water removal, fishing, logging, etc.) 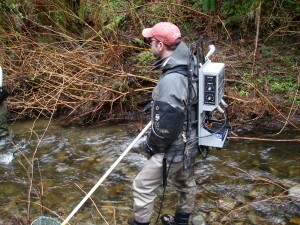 that affect the diversity and abundance of fishes and other aquatic organisms. We will thus explore the ways in which the important themes of basic and applied ecology are played out in different aquatic habitats. we have several representative habitats to examine on field trips near campus. This course will teach students to link general ecological principles with specific habitats and species. It will deal with applied aspects such as non-native species, fishing and habitat alteration but will be designed around habitats rather than specific land-use and management issues. Linkages will be drawn between habitats by both their physical aspects (water flowing from small streams to larger rivers or lakes, riverine and marine aspects of estuaries, etc.) and biological aspects such as migration between habitats. There will be three lectures and one field trip or lab session per week. The field trips provide opportunities to sample in three different environments (stream, lake, and marine) using different kinds of gear. 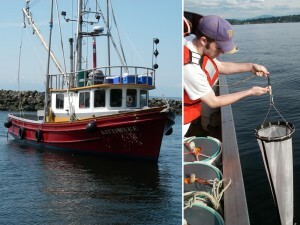 We collect data that are the basis for papers written in scientific format (Rock Creek and Lake Washington) and for a team oral presentation (Port Madison, Puget Sound). Lab sessions will be used for skills development, examination, analysis, and discussion of material and data from the field trips, and oral presentations. Students are strongly urged to enroll for the 5-credit section but those whose schedules do not permit the time required for the field trip and labs may enroll in a 3-credit section, which has the same lectures and exams but substitutes a different writing assignment for those based on the field trips.